When I hear from a happy Olympic Hot Tub Company customer who’s using SilkBalance in his beautiful Grandee Hot Spring Spa, it makes my day! Hi Alice: I wanted to tell you how much my wife and I have enjoyed Silk Balance. 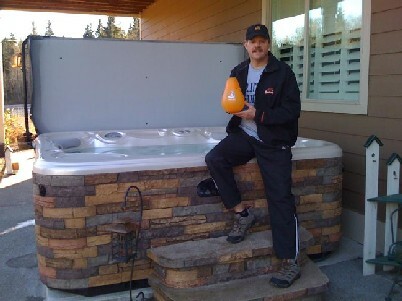 “For the first year of owning our Hot Tub we did the regular chemicals and tested, tested, tested. Our tub with usage would often end up murky and the seats and surfaces would get a slimy feel to them. Then we tried Silk Balance. Having the tub for only a year I thought only one purge would be enough but after starting with Silk Balance we had a number of releases of the buildup in our pipes over the first couple of weeks. This made us wonder as to whether the Silk Balance was working or not, but after those first few weeks, we have had nothing but clear water, no slimy surfaces, no chemical smells and our skin feel smooth and soft afterwords. We are actually using our spa more often because of it. Thanks to Ken for sharing his SilkBalance experience! I use my own hot tub much more than I used to now that I have SilkBalance in the water. No more dry, itchy skin. No more murky water, no more testing! Make the switch to SilkBalance today!